If you've been following me on social media, you might have seen that my summer hasn't gone as planned. One of our pups managed to tear both of her rear leg ACLs in the span of a couple months. The second one just three weeks after having the first one repaired. So we had to cancel some of our summer plans to deal with that, including a planned birthday trip to Disney World. The silver lining, I was instead able to buy myself a present I've been wanting for a long time - a 3D printer. I picked up the Monoprice Maker Select Plus 3D printer during Amazon Prime Day. Which wound up saving me about 10% off the cost. To say I'm in love with 3D printing is a bit of an understatement. It's opened up so many possibilities for printing toys, props, and even robotics parts. I'm so excited! One of the first things I printed was an amazing baby Groot from Guardians of the Galaxy. The model is by user Byambaa on Thingiverse and you can download it here. It printed in two parts. I chose the lower resolution models since they were a bit easier to work with. 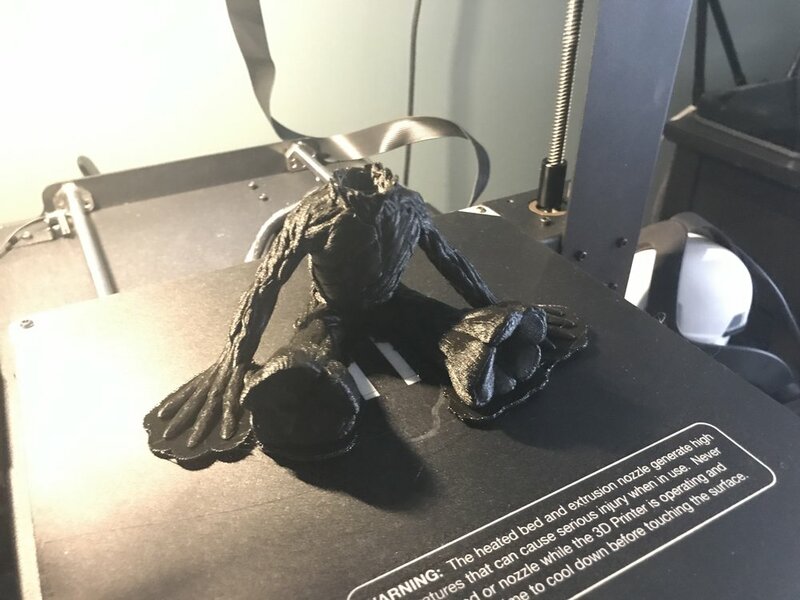 I ran into a bit of adhesion problems, especially with the hands on the body, so I did use rafts for the prints. I finished up with some spray primer and acrylic paints. So my next print project? Here's a hint: "Bleep Boop Beep Boop Beep"!